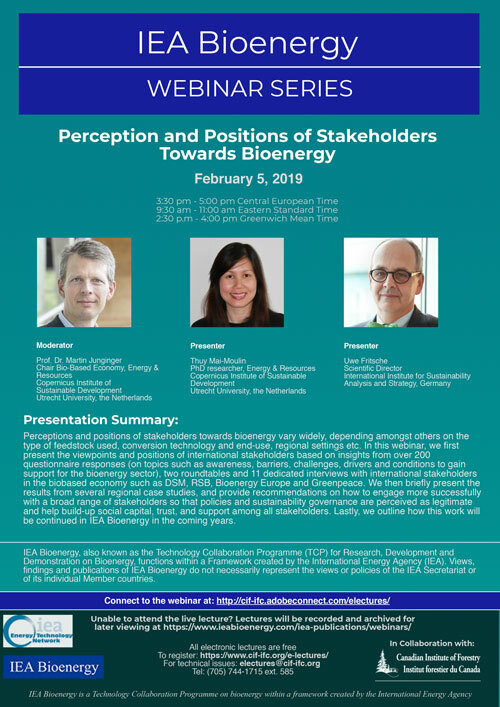 IEA Bioenergy invites you to participate in an international webinar entitled, “Perception and Positions of Stakeholders Towards Bioenergy” presented by Thuy Mai-Moulin and Uwe Fritsche, and moderated by Prof. Dr. Martin Junginger. This webinar will be held on Tuesday, February 5, 2019 3:30 pm – 5:00 pm Central European Time / 9:30 am – 11:00 am Eastern Standard Time / 2:30 p.m – 4:00 pm Greenwich Mean Time. For more information and a description of the webinar, please see the attached poster here.